The United Arab Emirates (UAE) was reportedly behind the incendiary statements attributed to Qatar’s ruler, which ignited the diplomatic row between tiny gas-rich gulf country and its neighbors, Washington Post reports citing unidentified US intelligence officials. 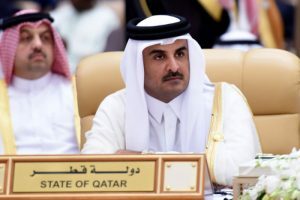 Qatar came in the eyes of the storm last June after its neigbors namely Saudi Arabia, the UAE, Bahrain plus Egypt shut down Qatari media sources, to protest remarks attributed to Sheikh Tamim bin Hamad Al Thani. In these remarks, as posted on the website of the Qatari news agency, QNA, and its associated social media, Sheikh Tamim criticized President Trump, praised Hamas and Hezbollah and called for better ties with Iran. The neighboring countries slammed the remarks arguing they breached agreements among the members of the Gulf Cooperation Council and the US-Arab-Muslim conference held during the May visit by President Trump to Saudi Arabia. Qatar vehemently rejected the accusation pointing out that the remarks were false and that its agency was hacked. The Saudi-led bloc on June 5 severed ties with Qatar, imposing sea, ground and air blockade. The Washington Post citing US intelligence officials noted that UAE officials discussed the hacking on May 23, i.e. one day before the act. The paper noted that the intelligence officials learned of the UAE’s involvement last week but cannot confirm whether Abu Dhabi “hacked the websites or paid for the hackings to be carried out”. UAE ambassador to Washington Yousef al-Otaiba rejected the report denying his country’s involvement. “What is true is Qatar’s behavior. Funding, supporting, and enabling extremists from the Taliban to Hamas and Gaddafi. Inciting violence, encouraging radicalization, and undermining the stability of its neighbors,” the ambassador said in a statement. Qatar has been working with the US and the UK to track the hackers. US Secretary of State Rex Tillerson has tried to mediate between the opposing sides and called for dialogue to solve the crisis, which took an unprecedented proportion after the Saudi-led bloc issued 13 demands as conditions to be fulfilled by Qatar before ties are normalized. Qatar has rejected the list of demands as “unrealistic” and said it is ready to negotiate. However, the boycotting countries say that the conditions are non-negotiable and that Qatar knows what to do. Posted by Jaber Ali on Jul 17 2017. Filed under Gulf News, Headlines. You can follow any responses to this entry through the RSS 2.0. Both comments and pings are currently closed.